The fastest controlled descent down a steep rock face might be to rappel (abseil) but Dan Simmons uses this technique in fiction too. It's the fastest way to become lost in The Abominable: A Novel. All you have to do is grab hold of a rope that feels real and then descend into his alternative reality. 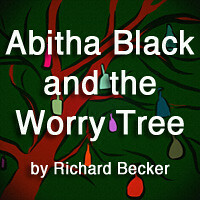 The telling of this tale might start in the present, but the story takes place in 1925. It purportedly comes from a collection of journals kept by Jacob "Jake" Perry, a travelogue author whom Simmons professes to have interviewed before writing The Terror in 2007. Perry, apparently impressed with Simmons' handling of The Terror, willed Simmons his personal journals in the hope the author might find a new story to tell. Simmons claims to have obliged him, polishing them up before pushing the manuscript onto his skeptical publisher. And if it were true? 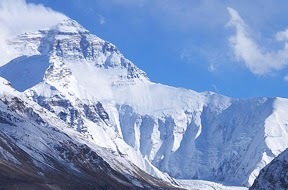 Then everything written about the historic expeditions to Mount Everest would have to be revised, including who the first climbers were to reach the summit well before 1953. 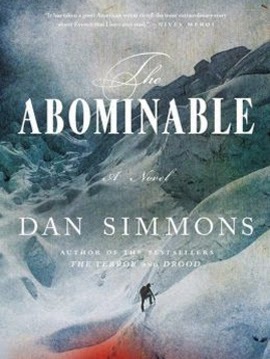 The Abominable is an epic mountain adventure thriller. In more ways than one, the most unfortunate aspect of the novel is the title. In calling it The Abominable, many readers pick it up with the expectation of finding yeti. So let's clear it up. This isn't a novel about yeti. And while the yeti have their place in the book, they are not cast as adversaries for the young protagonist Jake Perry. He has plenty of other challenges to worry about. Instead, this is a novel about an unrecorded expedition that took place between the Mallory-Irvine expedition in 1924 and Ruttledge in 1933. It is organized by Richard "the Deacon" Davis as a recovery mission to find the body of Lord Percival Bromley, a British nobleman who has gone missing on the mountain. American Perry and Frenchman Jean-Claude Clairoux are invited to join him. Funded by his grieving mother Lady Elizabeth Marion Bromley, the objective of the alpine-style assault proposed by the Deacon is not meant to shoot for the summit. It's meant to recover the body or personal effects of her missing son and provide closure. And yet, it seems intentionally unspoken and painfully clear that the Deacon has a secondary objective. If he and his two friends find themselves and their porters or sherpas within reach of the summit, they will ascend it. As massive as the mountain, the novel plays out in 672 pages and three acts. But that's not what makes it long. The first two acts are especially detailed, informative, and frequently repetitive in order to lend credibility to this found fiction thread as the polished writings of a travelogue writer. In sum, you can see what Perry sees, know what he thinks, and understand what he does. But it really isn't until the third act, when the author shifts his writing style to capture a never-before-recorded conclusion, that you experience it with him (outside of a few tenuous exceptions prior to the third act). Is the long wait worth it? Not if you expect Simmons to slide into the supernatural. This novel is an intriguing thriller of another kind, with consequences that eventually intersect with the fate of the world. A few graphs about author Dan Simmons. 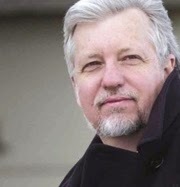 Dan Simmons is best known for his science fiction, fantasy, and horror novels, with the Hyperion Cantos being among his most mentioned work. But even before the Hyperion Cantos, his work had been recognized. His first novel Song Of Kali was a World of Fantasy Award Winner. Carrion Comfort earned him several awards, including the Bram Stoker Award in 1989. One of the most interesting aspects of his career was the break that came at the hands of Harlan Ellison. The short story The River Styx Runs Upstream won first prize in a Twilight Zone Magazine story competition in 1982. Prior, Simmons had worked in elementary education (and continued to do so until 1989). The Abominable By Dan Simmons Scales 6.6 On The Liquid Hip Richter Scale. The Abominable is one of those rare books that is sometimes difficult to appreciate until the last page. 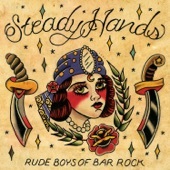 There are times it feel tedious in its detail and plodding in its pace. But looking back on it after its completion, it feels impossibly complete and as real, if not more real, than any historic account. The Abominable: A Novel by Dan Simmons can be found on Amazon. You can also download it for iBooks or order the novel from Barnes & Noble. The audiobook is narrated by Kevin T. Collins. The ride will change any preconception you might have about mountain climbing, especially historic climbs before technology made doing the impossible more plausible.